You’re alone. You’re vulnerable. And you have something that someone else wants. At any cost. So, here’s the deal. I’m not a huge fan of psychological thrillers (down, all of you Gone Girl fanatics!) Most of the time I end up guessing the end twist, and they give me tons of anxiety. So what in the hell made me request this title from Blogging for Books? I was intrigued, of course. It sounded extremely creepy and psychopathic. Seriously, someone has to be extremely twisted to hurt a pregnant woman. Well, to hurt anyone, really. But especially someone carrying a child—because who would hurt a child? I’m going to do my best to not give anything away here, because I definitely recommend this book if you enjoy thrillers. I think it would be a better read for a female, but I may be mistaken here. The story is told from three points of view: Claudia (first person), Zoe (first person), and Detective Lorraine (third person). It’s set in the UK and centers around the mysterious attacks on several pregnant women, all of whom appear to have had their babies haphazardly cut from them. Social worker Claudia is a pregnant stepmom of twin boys. Their mother died of cancer when they were babies, and their father, a Naval officer, remarried Claudia very soon after. Zoe is the newly hired nanny—though she has fabulous references and history working as a nanny, Claudia doesn’t trust her. Her husband is out of town for top-secret Naval work, and she’s by herself—is she safe with Zoe? The characters were constructed well, each in their own way. Mysterious Zoe, lovable Claudia, and stressed-out Lorraine, who is dealing with her own family BS while trying to solve this case. Every chapter keeps you on the edge of your seat, wanting to know more. The chapters cycle between the characters, so you have to figure out who is who. In the end, it’s almost impossible to tell, which really amps up the conclusion. I was hooked from the beginning until the very end. The only reason this gets a 4/5 from me is because I guessed the ending about halfway through, so one point lost for predictability. Overall, fabulous read and I would highly recommend! I will definitely be reading more of Hayes’s work. 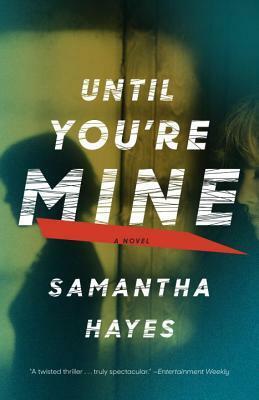 I received a free copy of Until You’re Mine from Blogging for Books and Broadway Books in exchange for an honest review! I’m adding this to my reading list.